In the summer, when the days are sunny and the skies are blue, not everything is rosy. Bugs, bees, flies and mosquitoes are out, making life miserable for everyone. At the top of the list of "worsts" reside hornets. They take over yards and lawns, making it impossible to grill, for the kids to play outside, or for you to simply enjoy the outdoors. 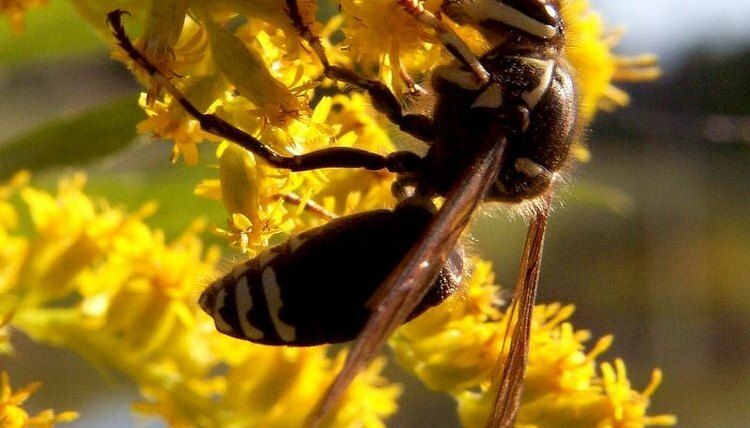 Fortunately, it's possible to get rid of them: In a few simple steps, you'll be well on your way to exterminating the hornets and enjoying the outdoors again. Locate the hornets' nest during the day and note which entrances the hornets use to get in and out. If the nest is underground, make careful note of where it's located. Approach the nest at night. Like humans, bees, wasps and hornets sleep at night. They'll all be in the nest, not foraging for food or flying around, so this is the ideal time to take care of them. They won't be attacking you, and you'll be able to take care of them relatively painlessly. Go slowly so you don't wake them or disturb them. If you can't go at night, be especially careful to avoid shadowing the entrances they use. Use a spray. If the nest is in a tree or on a playground, the porch, the house or some other high-up location, use a 15' spray like Raid to freeze the nest. Make sure you get the entrance, so you take out any hornets that were sent to guard the entrance. Then knock down the nest and spray it thoroughly. This will probably take two cans. To wipe out an underground nest, very carefully dump a mixing bowl full of boiling water and a little bit of lemon cleaner down the hole. Then cover the hole with a shovel full of dirt or the mixing bowl. Put dirt around the edge of the mixing bowl and leave it there for several days. Watch it and make sure there are no more wasps flying around. Add Drione dust to the equation (whichever method you've used to immobilize the hornets) by squeezing it either down the hole or onto the nest. This will finish off the process, killing all the hornets. Throw away the nest. Make sure you're dressed appropriately. Even if they're asleep, a couple of hornets might wake up in time to realize what's going on, and they won't be happy. Are Hornets More Active at Night or in the Morning? What Kind of Bees Have Hives in the Ground? What Animal Eats Ground Wasps? Where Does the Yellow Jacket Live? Do Ants Hibernate While It's Cold?